Commemorative stamps of Italy were only issued for three events in 1932, but the three commemorative sets contain a total of 56 different stamps! The commemorative stamps shown above (Sc. #268-79, #C28-34) were issued on March 14, 1932 to promote the Dante Alighieri Society. 10 C. - Giovanni Boccaccio (1313-1375) - Author. 15 C. - Niccolo Machiavelli (1469-1527) - Philosopher. 20 C. - Paolo Sarpi (1552-1623) - Scholar. 25 C. - Count Vittorio Alfieri (1749-1803) - Dramatist. 30 C. - Ugo Foscolo (1778-1827) - Writer. 50 C. - Count Giacomo Leopardi (1798-1837) - Poet. 75 C. - Giosue Carducci (1835-1907) - Poet. 1.25 L. - Carlo Giuseppe Botta (1766-1837) - Historian. 1.75 L. - Torquato Tasso (1544-1595) - Poet. 2.75 L. - Francesco Petrarca (1304-1374) - Poet. 5 L. + 2 L. - Ludovico Ariosto (1474-1533) - Poet. 10 L. + 2.50 L. -Dante Alighieri (1265-1321) - Poet. 50 C., 7.70 L. + 2 L. - Leonardo da Vinci's Flying Machine. 1 L., 3 L., 5 L., 10 L. + 2.50 L. - Leonardo da Vinci (1452-1519) - Artist, Engineer, Inventor. The Dante Alighieri Society is a national literary association, founded in 1889, to promote the development of the Italian language and culture. The society was named after Dante Alighieri, the Medieval poet who is regarded as the father of the modern Italian language. 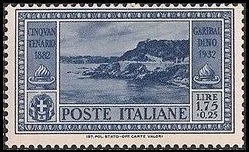 The seventeen stamps of Italy shown above (Sc. #280-89, #C35-39, #CE1-2) were issued on April 6, 1932 to commemorate the 50th Anniversary of the Death of Giuseppe Garibaldi. 10 C. - View of Caprera. 20 C. - Garibaldi meeting Victor Emmanuel II. 25 C. - Garibaldi at the Battle of Calatafimi. 30 C. - Garibaldi meeting Victor Emmanuel II. 50 C. - Garibaldi at the Battle of Calatafimi. 75 C. - Garibaldi carrying his dying wife. 1.25 L. - Garibaldi's tomb. 1.75 L. + 25 C. - Rock of Quarto. 2.55 L. + 50 C. - Garibaldi Memorial. 5 L. + 1 L. - Giuseppe Garibaldi. 50 C. - Garibaldi's home at Caprera. 80 C. - Farmhouse where Anita Garibaldi died. 1 L. + 25 C. - Garibaldi's home at Caprera..
2 L. + 50 C. - Anita Garibaldi. 2.25 L. + 1 L. - Garibaldi, Plane, Anita Garibaldi. 4.50 L. + 1.50 L. - Garibaldi, Plane, Anita Garibaldi. Giuseppe Garibaldi (1807-1882), actually born in France, became an Italian military leader and statesman, and he played a major role in the Italian Wars of Independence, leading to the establishment of the Kingdom of Italy. Along with King Victor Emmanuel II and Giuseppe Mazzini, he is considered one of the three "Fathers of the Fatherland". 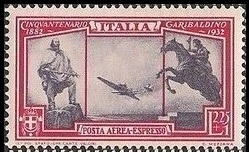 The twenty stamps of Italy shown above (Sc. #290-05, #C40-41, #E16-17) were issued on October 27, 1932 to celebrate the 10th Anniversary of the Fascist Government and of the March on Rome. 5 C. - Plowing with oxen and a tractor. 10 C. - Soldier guarding mountain pass. 15 C. - Marine, battleship, and seaplane. 20 C. - Portrait of a fascist youth. 25 C. - Tools and hands of workers. 30 C. - Flags, Bible, and altar. 35 C. - "New Roads for the New Legions". 50 C. - Mussolini statue in Bologna. 60 C. - Hands with spades. 75 C. - Excavation of ruins. 1 L. - Steamers and galleons. 1.25 L. - Italian flag, map, and points of a compass. 1.75 L. - Flag, athlete, and stadium. 2.55 L. - Mother and child. 2.75 L. - Emblems of drama, music, art, and sport. 5 L. + 2.50 L. - A Roman emperor. 50 C. - Eagle sculpture and airplane. 75 C. - Aerial view of Italian buildings. 1.25 L. - Ancient pillars and entrenchments. 2.50 L. - Head of Mussolini, trophies, and flags. These stamps of Italy were a benchmark in showing the progress made by Benito Mussolini and his fascist state in the establishment of a new Roman Empire. Unfortunately, over the next 10 or so years, it would begin to collapse into ruin.